It’s no secret that babies need a lot of sleep in their lives. Which is actually good for over exhausted parents because it’s only when the baby sleeps that parents can finally relax without having to worry about their child’s needs. But what about those dreaded nights when the baby just won't sleep? You’ve tried everything you knew, and yet, your baby’s awake, crying his/her lungs out. What could it be? If you’re tired of sleepless nights just because your baby can't go to sleep, then here is a list of things you should consider as to what could be triggering such a reaction in your child. Sometimes, all a child needs is the mother’s touch and baby will cry till he/she gets it. In such a case, co-sleeping is the best option for you. And don’t listen to what negative nellies have to say. If it works for you, it works for you – as simple as that. Co-sleeping! 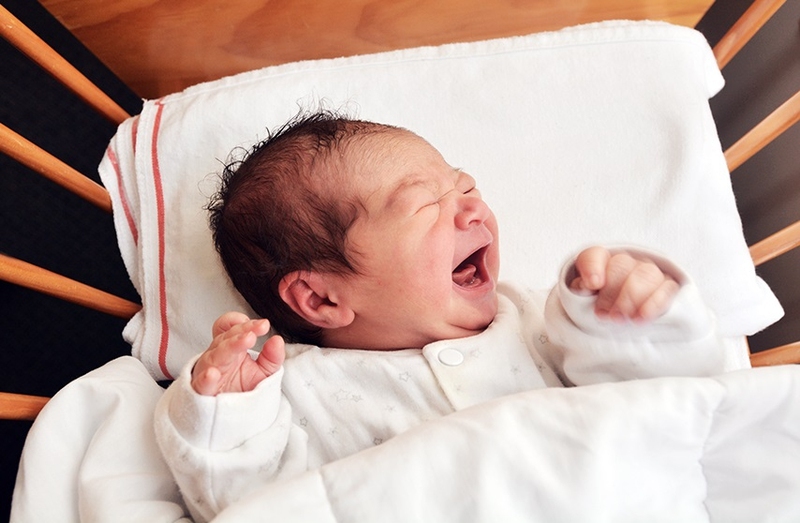 This is most common among newborns, because they still haven’t adjusted their body clocks. How could they – they’ve literally just taken birth! Their internal body mechanisms are awry, and you really can’t blame them for that, can you? Now you have to remember that the only way babies can express their pain is by crying, so if you’re stupefied as to why your baby’s bawling and won’t stop, check for bruises. If it’s nothing external, maybe it’s something internal, like an infection or a stomach ache. In such a case, take your child to the doctor. This is more common in older babies. Like us adults, babies tend to get bored of living their lives in a rut, and sometimes the reason why baby won't sleep is because they need a change. So you have to do what you can to shake things up a bit – mostly likely by changing their feeding time. This is a hit and trial method, so don’t lose your patience if it doesn’t work the first few times. Babies are used to a lot of movement – right from when they’re in your womb to when they come out of it. Movement eases the irritation they are feeling, and helps in soothing their physical anxiety. And if anything’s wrong with them, the first thing they need to do is to express themselves. Sure, crying is one way to go, and keeping them restricted is simply going to worsen their condition. Often when a child doesn’t get their sleep, they tend to become irritable and get fussy about the smallest of things. Conversely, having their senses over-stimulated by loud noises from the TV or toys makes it difficult for them to sleep. You have to create an environment for them where they can sleep without any distractions or disturbances. Teething is a terrible time for a child, because not only is it an uncomfortable phenomenon for them, but also because sleeping in certain positions puts pressure on their jaw, furthering their discomforts. So if your child seems okay during the day but acts up during the nighttime, the problem could be with their teething. Create a routine so that your child’s body clock becomes accustomed to that routine. Make sure to always have fixed times for meals and naps. If there are disturbances out of your control, then buy a white noise machine. You can even download the white noise app. Try singing a lullaby instead of rocking your child. Make things a little different from their regular routine. Gripe water is great for an upset tummy. It also works wonders on hiccups. In case of over-stimulation, turn down the volume, whisper to each other, keep the lights to a minimum and let your baby sleep in peace. Camilia containing teething powders are helpful. Teething toys, suckling, visual distractions and movements are good for babies. For children, try ice or cold water. Have extra light during the day. Open your curtains and let the sunshine in. Let the baby’s body adjust to the sunlight naturally. If your child is sleepy, but not sleeping, put them in their crib. That will help them associate cribs with sleeping and will make your job of putting them to sleep, easier. During night time, feed your baby when they are lying down. This will make them feel drowsy. Make sure your baby’s burps find their way out of their body. Holding them in can cause the mild discomfort. For an upset tummy, you can opt for gas drops. Check the room temperature to ensure it isn’t too hot or cold for the child. Check the corner of the room where the crib is placed to see if its temperature is the same as the rest of the room. Of course, it is very likely that the reason your baby won’t sleep is not because of one thing, but maybe due to a combination of factors. So again, as the parent it’s your duty to find out what’s wrong with your baby so that they can sleep in peace again.